Daktarin | Fungal Infection | Dokteronline.com Helps You Along! Daktarin 2% Mouth gel 20 gr. Daktarin 2% Mouth gel 40 gr. What is Daktarin used for? 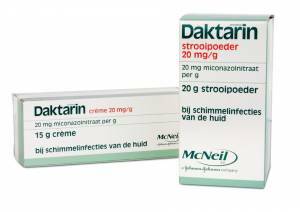 Daktarin cream is an antifungal medicine. The active ingredient miconazole kills various types of fungi and yeasts that occur on the skin and cause infections. If you have athlete's foot, a fungal nail or fungal skin infection, then order Daktarin online from a Dokteronline.com partner pharmacy. Daktarin cream is available in various forms. For vaginal fungal infections, we recommend Gyno-Daktarin and Canesten Gyno. For information on how to treat vaginal problems, click here. A red itchy rash on the soles of the feet or in the spaces between the toes, possibly with small pustules, scaling and a foul smell. Thick, brittle nails with yellowish or brown discolouration, possibly with itchiness of the surrounding skin. Daktarin kills the fungi and yeasts and treats the infection, allowing the skin and nails to heal. You can order Daktarin quickly online from our partner pharmacies. Daktarin is available as a cream, powder and nail tincture. Instructions for use are listed below. Daktarin cream: apply the cream thinly to the affected areas twice a day. Wash and dry the skin thoroughly before applying the cream and remove any loose skin. Keep treating the affected skin until the infection disappears and continue use for one more week to prevent the infection from recurring. Daktarin powder: apply to infected skin. The powder can also be dusted inside socks and shoes which are in contact with the infected area. Sprinkle a small amount in socks and shoes to kill the fungal spores which may have survived. This is to prevent reinfection and treat the infection faster. Continue to use the powder for at least 10 days after all signs of the infection have cleared up. Daktarin nail tincture: designed for treatment of fungal nails. Penetrates deeply into the nail plate for thorough and long-lasting relief. Apply thinly to the affected toenail once or twice a day. Remove old layer with acetone before applying a new layer. Continue to use the tincture until the infection has cleared up. Athlete's foot takes about two to six weeks to heal. Fungal nail infections are more persistent. Because toenails only grow slowly, treatment generally takes seven to eight months. Do not apply to broken skin and avoid contact with the eyes and other mucous membranes. Wash hands after use. Read the package leaflet before use. Daktarin does not cause side effects. In rare cases, skin irritation such as itching or burning may occur. Consult a doctor if these side effects are persistent. Do not use if you are allergic to miconazole or any other ingredient in this medicine. Daktarin cream or powder should not be used to treat vaginal yeast infections. Gyno-Daktarin cream is used to treat vaginal yeast infections (available on prescription).